The Sansui G-8000 receiver was created at a time when Japanese manufacturers were competing to produce the meanest hifi beasts, like this Pioneer SX-1250 I restored. 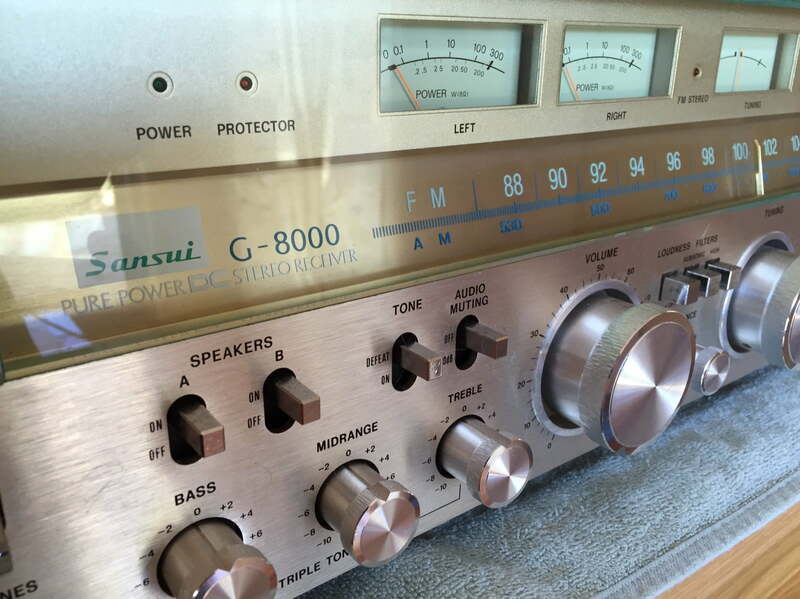 The G-8000 is not quite as mean as the SX-1250, but make no mistake, the big Sansui is a real monster. A quick look at the specs over at Hifi Engine shows that this receiver puts out 120 watts per channel into 8 ohms. More information can be found at Classic Receivers. The Sansui G-8000 features great build quality, something we normally associate with gear of this vintage and price, no surprises so far. All major circuit blocks are located on their own boards and some are fitted inside shielded boxes, as is Sansui tradition. This is a nice touch that appears a lot in gear of the period. Sadly, we rarely see it now. One thing worth noting with this design is that Sansui used a lot of board-to-board interconnects. These are nicely executed with gold-plated pins in most cases, but the connectors were quite loose in this receiver. Also worth noting is the incredible complexity of a piece of analogue engineering such as this. There are so many switches, rotary controls and wiring, all of which accumulates dust and dirt over time and can cause problems. The issues with this Sansui G-8000 related to these connectors, controls and dirt, as well as some not very clever previous repair work. 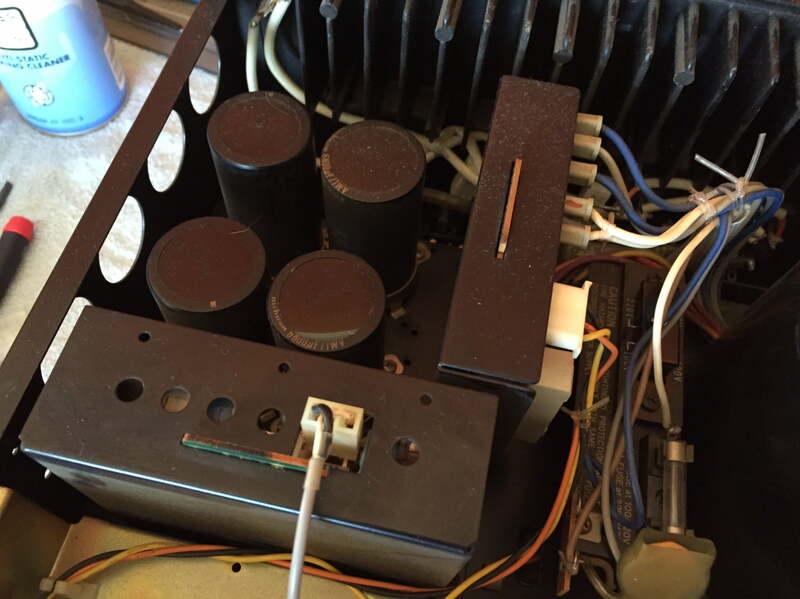 According to its owner, one channel was cutting out intermittently and the controls were noisy. I found loads of dirt, excessively high DC offsets in both channels and idle currents set to almost zero in both channels. Servicing the big Sansui involved cleaning and lubricating all of the switches and controls. It’s important to use a quality cleaner and lubricant for this. I tend to use isopropyl alcohol to clean controls like these at it whisks away oily residues that can accumulate inside switches and potentiometers. I then sparingly apply a premium lubricant like Caig or Contact Chemi. I systematically remade every board-to-board interconnect i could physically get to and some of these were clearly very loose. I then power the receiver up and let her idle for an hour or so, before adjusting DC offsets to zero in each channel and setting bias to 16mV. The intermittent channel issues are fixed, which is great news for this lovely old receiver and she certainly will sound much better than she did, with bias current correctly set and no DC biasing the speaker voice coils as it was. Now inside the chassis and we can see that some engineering has gone into the G-8000. In the top centre, we can see a large toroidal power transformer, flanked by two banks of four large filter capacitors per channel. 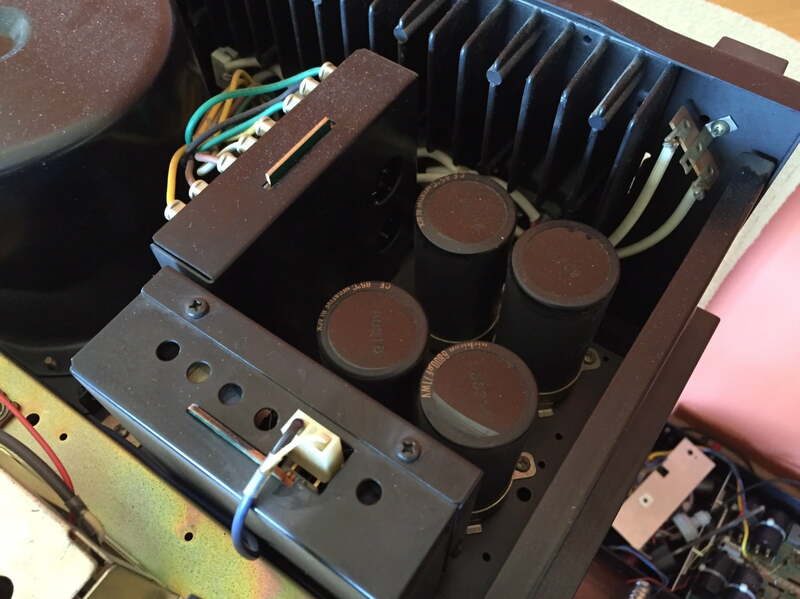 those vertical boxes near the filter capacitors are the associated power supply circuits. Along the top we can see the heatsink, to which all the output transistors are attached. Front and centre, we have the tuner board and front end, and to the left we have a smaller secondary regulated power supply, probably for the tuner and preamp circuits. Detail of one channel’s power supply filter capacitors, power supply circuit board and in the foreground, the driver and bias circuit for one channel, inside a little shielded can – very nice touch. Adjustments for bias and offset are made through those holes in the top edge of the shielding box. Same arrangement for the other channel, except that this time, some previous ‘repairer’ has managed to lose the lid to the bias and driver board box – you can see where the three screws held the lid in previously. I will never understand how people can lose parts like this when working on equipment. I mean – how do you lose an entire metal lid and screws?? Close-up of that regulation and protection board. I remade all those connections you can see, probably a dozen just in the area covered by this photo! Right, down to business. After zeroing out the DC present in both channels, it was time to set bias current. The number we are looking for here is 16mV across the measurement point you can see me clipped into. And here she is, working perfectly again, all ready to go back to her loving owner! 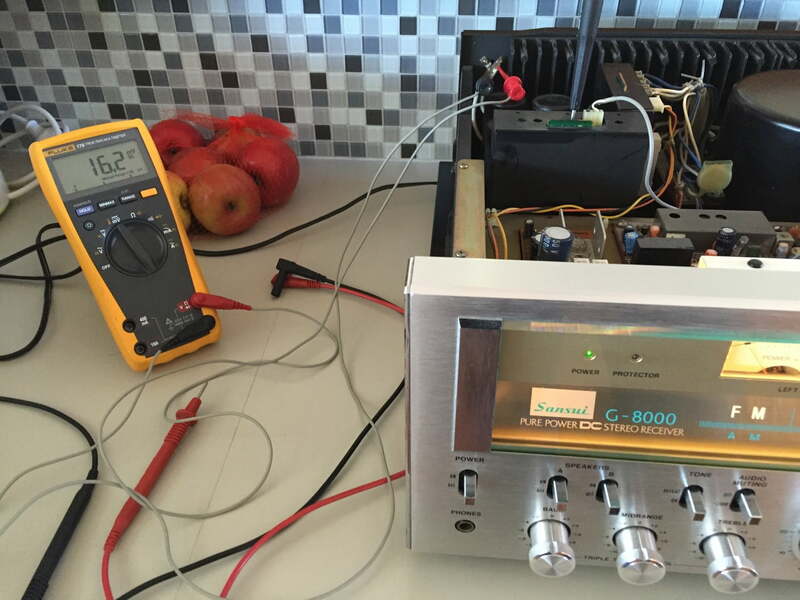 I have a sansui receiver G 8000 and my right Channel went out. I need a new speakers input board. Hi Rayay, thanks for commenting. I would need your receiver in for inspection and repair. Are you local and able to bring her in?